I have been looking for a way to hide kale into everything that I eat. I know it’s good for you, but the taste and texture of it just turns me off. I apparently can only stomach it when it’s in a heavily sauced soup or stew with strong flavors (like curry or coconut milk). So, I wanted to come up with a way to introduce kale into something that I actually enjoy that has strong enough flavors to mask the taste of the kale. I thought, “Why not dehydrate it and turn it into a powder?” Not only will the get rid of the off putting texture, but it should also down play the flavor of the kale itself. So, I took 4 large handfuls of kale and tossed it onto two large baking sheets. No oil. No salt. No nothing. I then placed both trays into a 250°F (120°C) over for 30-45 minutes, or until the leaves were crispy. The temperature was so low, that the leaves would lose all of their moisture without burning. Once the leaves were out of the oven and cooled, I placed them into my grinder and let it go to work. The final product was this green powder that just went everywhere at the slightest hint of a breeze through my apartment. I had to turn off my kitchen fan before I could move the powder into a storage container. 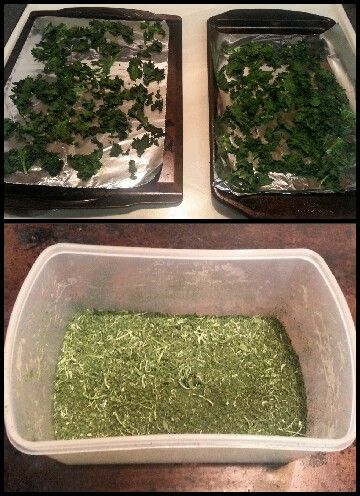 Now, you might think that two full trays of kale would yield a lot of powder, but after the drying and grinding, I probably only ended up with about 1/4 of a cup. Not bad, but I definitely wouldn’t do it again until I was desperate for kale. Until then, I’ll just keep on drowning it in curries and coconut milk based dishes. Now that that’s all done, on with the cookies! This recipe is actually pretty simple (the only hard work was with the kale. 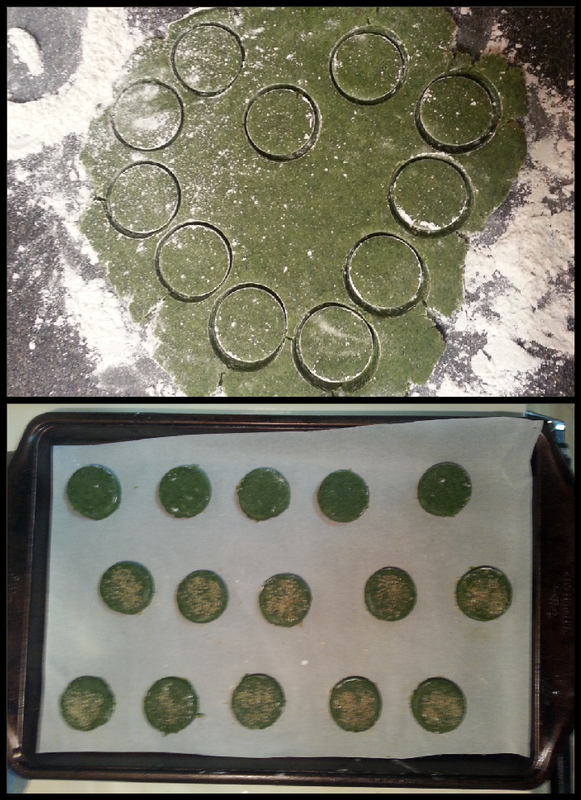 I hate kale) and yields about 25-30 cookies (I get 29 with the cookie cutter than I used.) This recipe is also totally doable without the kale. Since these cookies already have the avocado and coconut oil, you’re still getting those healthy fats that you wouldn’t get from butter, so they are already better for you. The kale just ups the nutritional value even further. Totally Missing the Granulated Sugar and Vanilla in This Pic… Oops. *I usually use turbinado sugar in my baking, but cookie dough isn’t a good vessel for such a large grain of sugar. It doesn’t bake long enough for it to dissolve into the cookie, so when you bite into it, you are still tasting each individual grain. So, the sweetness of the sugar isn’t fully melted and incorporated into the cookie, which isn’t delicious. **I just make it myself by zesting a few lemons and then adding just enough white, granulated sugar to coat them. I then let it sit for about a day or two before I use it. It’s supposed to look kind of like a lemony syrup. That’s because all of the essential oils in the zest have seeped into the sugar. It is the ideal addition to anything you’re baking that has lemon in it, but you want to be careful, because if you add too much, it’ll affect the texture of your cookies. It’ll make them chewier, and that’s not delicious. The only real texture you want is from the poppyseeds. ***I know it doesn’t seem like much, but just remember that that 1/5 of a cup of powdered kale came from the two baking sheets that I had of dehydrated kale. It is enough kale. ****This is just to add a bit of crunch to the cookies. Before you put them in the oven, sprinkle a little bit on top to give the cookies some extra texture. DO NOT USE it in substitution for the granulated sugar. Trust me, it DOES NOT end well. Add avocado and coconut oil to stand mixer using the paddle attachment. Blend until mixture is creamy and you can’t see anymore lumps of coconut oil or avocado.The avocado and coconut oil should have a mousse-like texture. Add the granulated sugar and mix on high speed for at for 1 minute. It really breaks down that sugar and allows it to become incorporated into the mousse. Once combined, add the lemon sugar and powdered kale. Mix until fully combined. On the Left: Avocado and Coconut Oil Mousse. 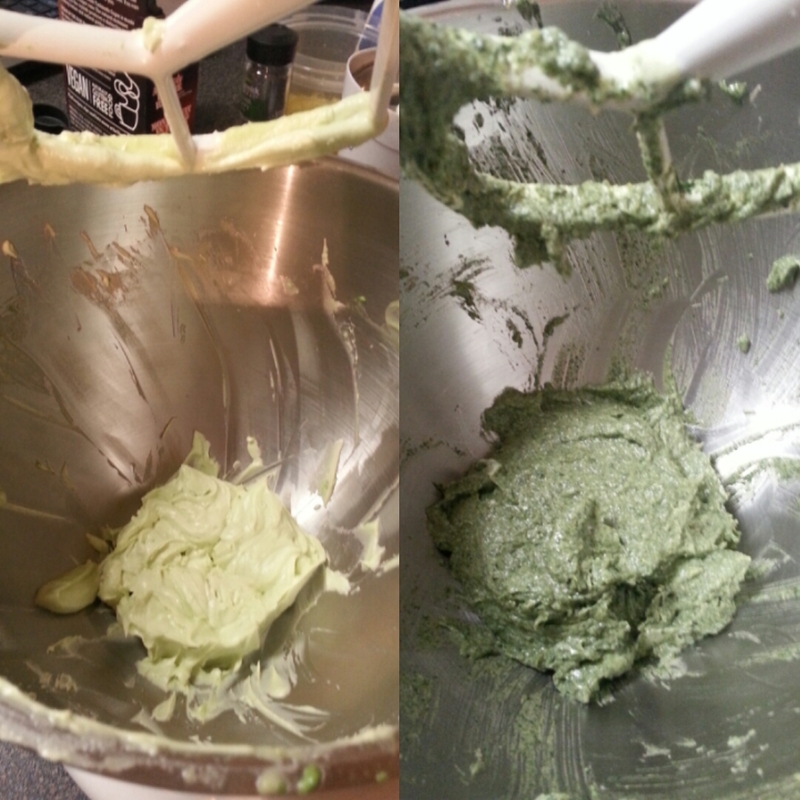 On the Right: Sugar, Powdered Kale, and Lemon Sugar Added to That Mousse. Added the sifted flour and salt and run the mixer until the dough just comes together. Stir in the poppyseeds by hand, being careful to not overwork the batter. (I had a hard time with this because the dough was completely green and the poppyseeds just got COMPLETELY lost. So I did like 10-15 folds just to make sure that I didn’t see any seeds at the bottom of the bowl). Turn your dough out onto a piece saran wrap. Wrap it up and place it in the fridge. Let your dough chill for at least 30 minutes. 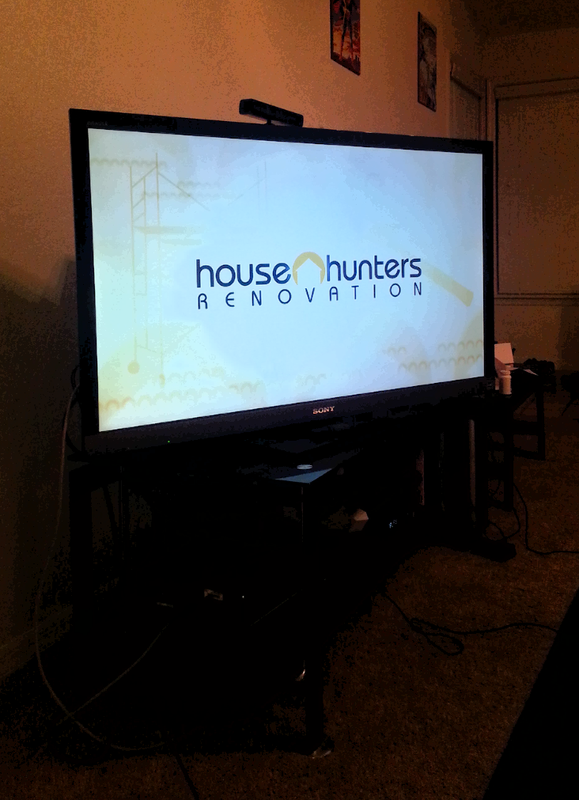 Catching Up On Some House Hunters While Waiting for My Dough to Chill. Take your cookie dough from the fridge and drop it on a floured surface. Roll your dough out to about 1/4-1/2 of an inch in thickness. Grab a cookie cutter and cut out your dough (I used a circular cutter that was 1-3/4 inch in diameter). Lay your cookies a lined baking sheet (I just use parchment paper) about 1 inch apart (without a leavener, these cookies won’t spread or rise. So don’t worry about them touching each other). 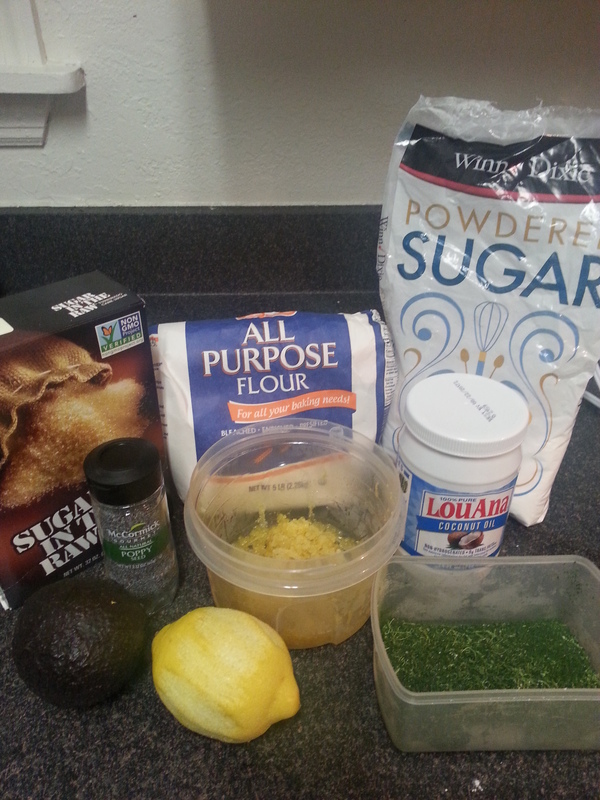 My Green Dough. Rolled Out. Bake for 8-12 minutes, or until the edges have just started to brown and the centers are still soft to the touch. Remove your cookies from the baking sheet and place them on a cooling rack (the cookies will harden as they cool. If they feel hard when you pull them out of the oven, they are over baked). Once your cookies have cooled, mix 4 teaspoons of lemon juice with 1/2 cup of powdered sugar to create your glaze. You want it to be thick enough to coat your spoon but thin enough to drizzle on top of the cookies. Drizzle your cookies with the glaze. Let them chill out while the glaze sets up (hardens). Once set, ENJOY! Now, you won’t get the exact texture of a plain, butter-filled shortbread cookie, but it’s pretty damn close. Not only do you get the added texture of the poppyseeds and lemon zest, but you also get the added flavors of them. Then there’s the extra something that the kale adds, which I don’t mind (which is a surprise because I hate kale), but the amount of effort I went through just to be able to add kale to something I love,… it is so not worth it. Like I said, I hate kale, and will continue to hate kale, but at least now, I have an edible recipe to make it more bearable.